After three years of hard work, my partner and I finished our latest project, the rebirth of an old lady who’d been born in 1942 – an Indian motorcycle (or rather a collection of parts described as a motorcycle). We spared no effort in making this machine one of a kind, a bike to turn heads and be talked about wherever riders meet. Having completed the bike, we looked around for somewhere to show it, and decided that the October show at Ardingly would be the place, particularly as a good crowd would be there for the Norton Commando’s 50th birthday celebration. 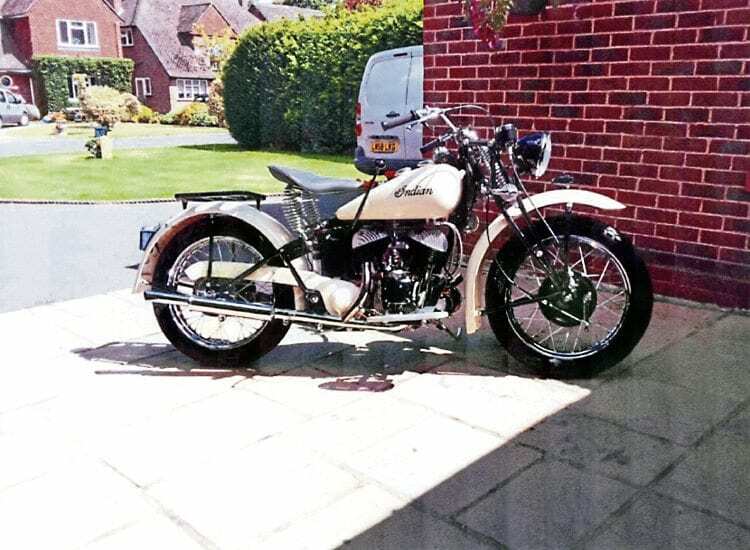 Built up from an assorted pile of bits by Patrick and his partner, this beautiful 1942 Indian deservedly took top honours at the October show at Ardingly. The accompanying photo shows that we came away with a hugely satisfying first place, and to give some idea of the standard of finish of the machine, our appearance also generated an invitation to attend the prestigious August Bank Holiday Festival of Transport at Blenheim Palace. rosette that said “First, 29th Oct, Ardingly Show” and the old lady is still sitting in our workshop with this testament to our efforts stuck on the headlamp. I hope you give this matter serious attention, and to give OBM subscribers proof of your fairness by publishing this letter. events to attend. Congratulations on such a beautiful-looking machine. – Ed. Read more Letters, News, Opinion and Features in February’s issue of OBM – on sale now!